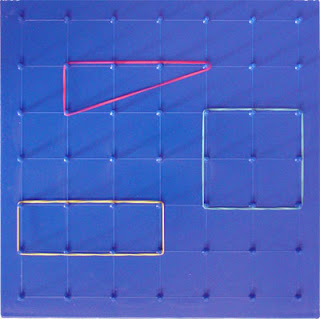 Geoboards are concrete materials that can be introduced to children when they are doing multiplication or problem solving activities. 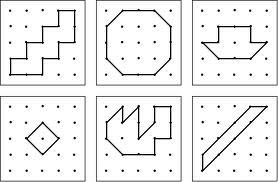 How many different shapes can you make with one dot / two dots untouched in the shapes you made? Find out the area of the different shapes you made. When I did the activity during lesson time, I came to realize the pattern between the number of dots touched with the area of the shape. Children can come to realize Mathematical concepts when they are manipulating with Geoboards too.